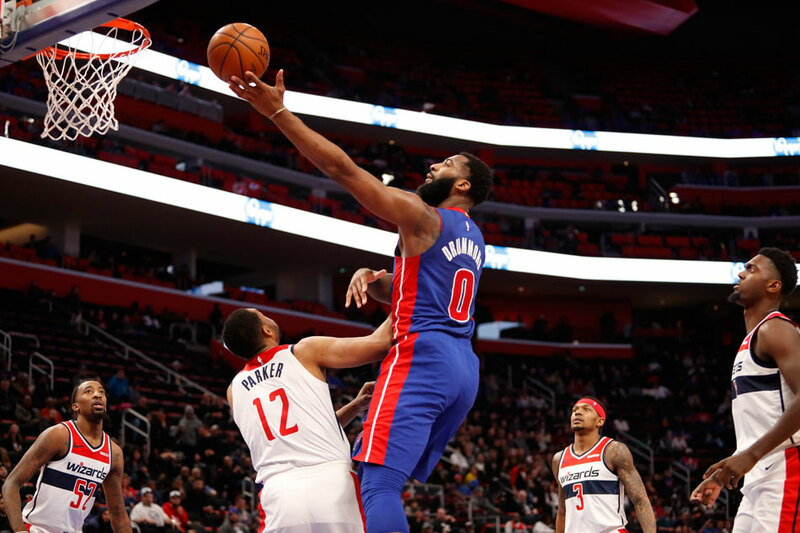 Andre Drummond poured in 32 points, one shy of his career high, and the host Detroit Pistons increased their winning streak to four games with a 121-112 victory over the Washington Wizards on Monday. Drummond, who is averaging 26.3 points during the streak, also contributed 17 rebounds and four steals against Washington. Blake Griffin tossed in 31 points with nine rebounds and nine assists for the Pistons, and Reggie Jackson had 16 points. Luke Kennard added 15 points off the Detroit bench. Wayne Ellington, signed after clearing waivers over the weekend, was limited to two points on 1-for-8 shooting in his Detroit debut. Bradley Beal had 32 points and 10 assists to lead Washington. Bobby Portis supplied 24 points off the bench, hitting six 3-pointers, and Trevor Ariza piled up 23 points, seven rebounds and five assists. Wizards starting point guard Tomas Satoransky missed the game due to personal reasons. Detroit had a 48-37 rebounding advantage and outscored Washington 56-40 in the paint. Griffin scored 20 first-half points, and the Pistons led 61-59 at halftime. Drummond had 17 points and 10 rebounds before the break while Beal's 16 points led the Wizards. The Pistons used a 16-4 run to take an 84-73 third-quarter lead. Jackson made a pair of 3-pointers during that span, Drummond supplied a layup and a dunk, and recently acquired Thon Maker drilled a corner trey. Kennard finished the outburst with another 3-pointer. Drummond scored 10 points in the quarter, including two free throws and an alley-oop layup in the final minute to give Detroit a 90-79 lead. Layups by Maker and Ish Smith made it 94-81. Kennard's long 3-pointer with 6:38 left pushed the Pistons' advantage to 105-90. Ariza drained a couple of threes and Portis tossed in another to cut the Wizards' deficit to 112-103 with 3:15 left. Portis knocked down a corner 3-pointer to make it an eight-point game with 1:15 remaining, but Detroit put the game away at the foul line. The Pistons won the season series 2-1.